The TARDIS arrives on the planet Androzani Minor. Examining the ground, the Doctor finds traces of fused silica  evidence of a visiting spacecraft. He also points out to Peri a set of tracks leading to and from some nearby caves, which they then visit to investigate further. Peri slips and falls into a strange sticky substance which makes her legs sting, and the Doctor helps her brush it off with his hands. Moving deeper into the caves, they find piles of weaponry belonging to gun runner Stotz (Maurice Roeves) and his hired hand Krelper (Roy Holder). They are captured by Captain Rones (unknown) who assumes they are gun runners and has them sent to General Chellak (Martin Cochrane). The General uses a holographic communicator to report to Morgus (John Normington) back on Androzani Major. Morgus is the head of several conglomerate companies and is involved in funding the war against the gun runners. He seems concerned on learning that some gun runners have been caught, but when he sees the Doctor and Peri he orders that they be shot immediately, despite Chellaks feeling that they could be a source of useful information. Chellak has his aide Salateen (Robert Glenister) place the Doctor and Peri in detention. Chellaks conversation with Morgus has been monitored by a black-garbed and masked figure who takes a fancy to Peri. He starts to assemble components in his laboratory and orders androids four and nine to join him. Peris legs and the Doctors hands are coming out in blisters. The Doctor is suspicious of Morgus, and of Salateen. Someone enters their cell via a secret door. Morgus receives the President (David Neal) in his office and gives him some spectrox  a drug that at least doubles the life span of humans. The war is holding up spectrox supplies and the President is considering offering an armistice to Sharaz Jek, the person responsible for it. Morgus is horrified. On Androzani Minor, the Doctor and Peri are apparently executed by firing squad. However, they are revealed to be androids. The real Doctor and Peri have been rescued by the figure in black, Sharaz Jek (Christopher Gable). Although attentive to Peri, he is unstable and apparently insane with loathing for Morgus, whom he blames for all his problems. 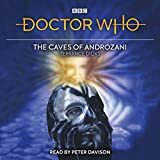 He declares he will stop the war only when he has Morguss head delivered to him, and states he has no intention of letting the Doctor and Peri go. Via his communication network, he knows everything that Chellak is planning and is confident that he can hold out for long enough against the army. The Doctor and Peri meet Salateen, who has been held captive for some time while one of Jeks androids takes his place at Chellaks side. Salateen laughs when he realises that the Doctor and Peri have contracted spectrox toxæmia from touching raw spectrox  deposits from colonies of bats which live deep in the caves under Androzani Minor. The time travellers are experiencing cramp, which is the second stage of the illness. Salateen initially tells them that there is no cure but then admits that there is an anti-toxin, discovered by Professor Jackij, which is found in the milk from a queen bat. Unfortunately all the bats have gone to the deep caves, which are devoid of oxygen and prowled by a vicious magma creature (Colin Taylor). Jek explains that he wears a mask because he was hideously burned when Morgus trapped him in a mud-burst; he was able to get to a baking chamber to escape the mud, but in the process was scalded nearly to death. Jek goes to meet Stotz to argue over the amount of payment for the recent shipment of lost weapons. In his absence, the Doctor is able to disarm the guarding android as it is programmed to recognise humans and his anatomy is different. The Time Lord has decided to get the queen bat milk himself. The Doctor is wounded when he, Salateen and Peri are attacked by an android while moving through the caves. Salateen hurries Peri off to General Chellak, and the Doctor then has a close encounter with the magma beast as it attacks Stotzs party, who have been trying to find Jeks private store of spectrox. The Doctor is recaptured by Jek who uses his androids to torture him until he discloses where Peri is. Stotz wants to take the Doctor back with him to Androzani Major and Jek agrees. Meanwhile Chellak and Salateen are planing to feed Jek disinformation through the android Salateen and through broadcasts to Morgus regarding an attack on a fake location for Jeks base. In this way they hope to catch Jek unawares when they mount an attack on him in his true location. Returning to his spacecraft, Stotz reports to his boss back on Androzani Major. It is Morgus. Morgus sees the Doctor on the ship and regards this as proof that the President must suspect him. He therefore kills the President by pushing him down a lift shaft and makes plans to travel to Androzani Minor to negotiate with Jek in person. Stotzs ship takes off, but the Doctor manages to free himself and pilot it back to Androzani Minor. Jek recaptures Peri who is by now very weak indeed. He raves about everything being Morguss fault. 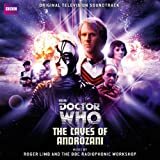 As the Doctor races across the surface of Androzani Minor, chased by Krelper and his men, Chellak and Salateen make their way towards Jeks base. Jek has not been fooled at all, however, and the troops are ambushed by his androids. Salateen is killed along with some of the troopers, but Chellak pushes on. Eruptions on the surface herald the start of a mud-burst and Krelper returns to the spaceship to find Stotz and Morgus in conversation. Krelper is sent away and Morgus offers Stotz a share of the spectrox. He intends to take Jeks private store of the drug and live on another planet in the Sirius system. Jeks androids are being overrun by Chellaks men. Jek goes to see if any of them can be repaired, but he too runs into the troops. Chellak chases Jek back to his lab where the two men struggle. Jeks mask is pulled off and Chellak recoils in terror. The distraction allows Jek to push him outside into the path of a mud-burst, where he is killed. Morgus calls his office and discovers to his horror that his secretary Timmin (Barbara Kinghorn) has taken control of his business  she is now Chairman and Chief Director of Sirius Conglomerates and has given evidence against him. His empire is finished and all his funds have been sequestered. With Morgus no longer in a position of power, Krelper rebels. He wants to return to Androzani Major with the spectrox they already have. Stotz guns him down, along with the remaining gunrunner (Gerry OBrien). He and Morgus then go to the cave system to try to find Jeks spectrox store. Jek is mourning Peri, who is almost unconscious when the Doctor arrives. The Time Lord borrows an oxygen cylinder from Jek and tells him to keep Peri cool while he gets the bats milk. While the Doctor is gone, Stotz and Morgus find Jeks lab. Jek throws himself at Morgus and forces his head into the path of a laser beam, killing him. Stotz shoots Jek but the android Salateen arrives and kills Stotz. As fire breaks out in the lab, Jek dies in the arms of the android Salateen. The Doctor returns with the milk in time to carry Peri out. As the planet erupts around him, the Doctor gets back to the TARDIS and gives Peri the milk. She recovers quickly but there is none of the antidote left for the Doctor, who regenerates in order to save his own life.